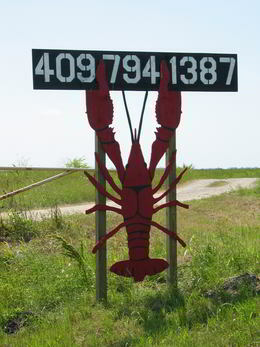 For the last 25 years we have sold fresh purged crawfish. What's does purged mean? Have you ever noticed a gritty taste in your crawfish? Do they have a slight taste of dirt? That means that your crawfish were probably not purged. Purging means that they have been cleaned after they have left the field and before they have been sacked. Some people prefer unpurged crawfish. Guess they like the added taste of mud! We prefer to eat ours purged and we think you will as well. Not sure if your crawfish are purged. Aren't most crawfish purged? No, not all crawfish are purged. In fact, many are sacked right in the boat with minimal time to remove trash. It takes an extra step and equipment to bring them up to the purging tanks before sacking. Did your brother-in-law find some really "cheap" crawfish? 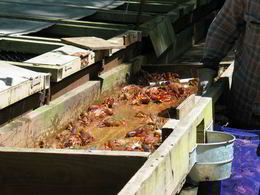 Could be that those crawfish are cheap because they are not purged. Why should you let us do the purging for you? When you try to purge crawfish yourself in your son's kiddie pool full of salt water, you're doing very little good. Because the water is not circulating, and the crawfish are all crammed together, the dirt is not able to move out of the crawfish. That foam they are spitting out of their gills? It isn't them trying to clean themselves. Instead that is the crawfish's attempt at gasping for air. They can't breathe in salt water and they are trying desperately to remove it from their gills. If you do choose to purge your own crawfish, please cook them immediately because they will quickly die from the salt and have the potential to spoil. You've worked too hard throughout the week to have to mess with purging and washing your crawfish. It's your turn to fire up the burner, sit back and drop a few crawfish and enjoy yourself! Our sacks run around 30-35 pounds. We take large orders, but we also take orders for just one sack. Need a little less than 30 pounds? Give us a call and we can probably work with you. It's Friday afternoon and your mother-in-law just asked you to get some crawfish for the weekend! Give us a call. We recommend reserving your sack early in the week, maybe even the week ahead if it's a busy weekend like Easter or graduation, but we are always willing to do our best to do our best to get you crawfish. It never hurts to ask. Your first time to buy crawfish? We'll try to make it as easy as possible and talk you through whatever you need.